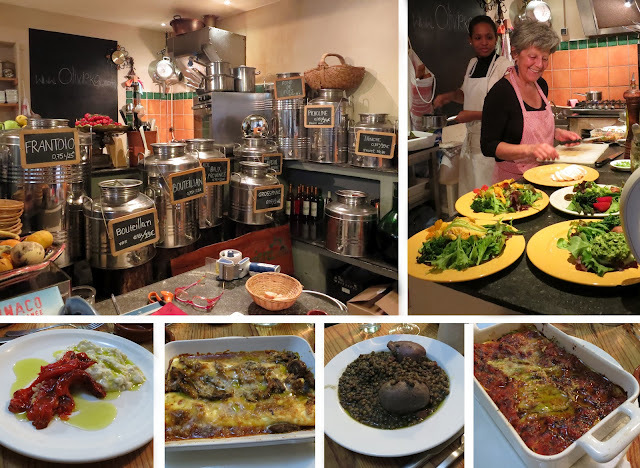 FRANCE: Our trip to southern France was hands down my favorite part of the trip. I love the atmosphere, the surroundings, the beaches, and the food!!! The food, all of it, was so tasteful. And the dainty pastries... especially the croissants, are to die for! The French seem to be obsessed with perfecting dishes. They even serve you food and drinks on the beach! Only thing is, the coffee in France was disgusting. Wish they put half as much effort in their coffee as they do to food and other beverages. Also, everyone looks good here. We felt very under dressed. Definitely coming back here! Nice - Unfortunately, it rained for most of our stay there and cleared up when we left. Our Airbnb (by the way Airbnb is super sweet for accommodations!) host recommended an awesome restaurant called Oliviera in the old town. The restaurant is owned by a local couple who are really passionate about olive oil and the food they serve up. I never met anyone who loves olive oil more than Nadim! Everything they prepare is local. We got to sample different olive oils. They all taste so different! My favorite was Cailletier, made from Nice olives. I also had the best lasagna ever here... so fresh! Also, advice for restaurants in France, book in advance. For many restaurants, when you book a table, it's yours for the night. People seem to like to chill and have really, really long dinners. 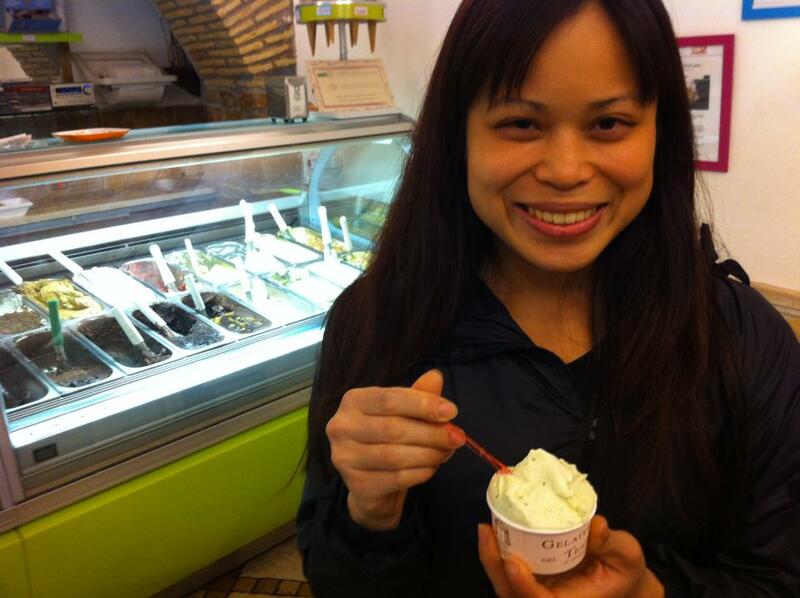 Also, the gelato at Fenocchio is tasty! 2. Dinner at Oliviera. Clockwise: all the different olive oils, Nadim's wife the chef, the house appetizer, some meat dish, homemade sausages and lentils, best lasagna ever. They also cook right in front of you! 3. Rocky beaches in Nice. Eze - On our way to Monte Carlo, we stopped in Eze since it looked so pretty from the train. Actually, the entire train ride along the coast is really beautiful. Would love to visit other areas like Antibes and Villa Ephrussi de Rothschild. Wish we had more time in Eze to explore the actual village. But the beach was very, very pretty. 4. Me at a public beach in Eze. Monte Carlo - I guess it's technically Monaco. Holy balls, this area is loaded. Everyone drove super super fancy cars like Bentleys, Aston Martins, and Ferarris. High class and luxurious ambiance. I feel like everyone here was ridiculously rich and if you weren't rich, they kind of looked down on you. Our terrible dining experience at Cafe de Paris pretty much did it for me. 5. The pretty boats at the water! Cannes - My favorite... and probably of all places I've been to! Such a gorgeous city and something about it just had me all over it. Sandy beaches and some of the best restaurants! We had our best dinner on the trip in Cannes at Le Caveau. It was packed! We got the three-course menu and everything was divine. Best filet, ravioli, and creme brulee ever!! If only I remembered to take pictures. I also really wanted to dine at La Palme d'Or in the Hotel Martinez, but unfortunately they were closed on the two days I was in Cannes! Actually a lot of restaurants are closed on Sunday and Monday, lame. The other awesome thing about Cannes is there is a CrossFit gym in the main area! We stayed ~200m away from it! The beaches are also probably the most beautiful I've seen in Europe. 6. Pretty sandy beaches in Cannes! Chill here with a nice glass of wine and nonstop alcohol service. 7. View of Cannes from the church at the top of the hill. Also did a WOD here! 8. Nothing like WODing on the streets of Cannes! Flipping a ~90kg tire up a series of stairs! ITALY: We spent the bulk of our trip in Italy. Unlike France, food in Italy was really hit or miss, but when it was good, it was really good. Both countries seem to value cooking with local products. Italy seem to be really strict on made in Italy products, especially with food. Tomatoes, basil, bufalo mozzarela, olive oil, and zuchinni flowers were really good, very fresh, and everywhere. Pastries were not that great. They pretty much top everything with a lot of sugar. Croissants don't need sugar! Anyway, Italy has a lot of really old churches, ruins, and museums everywhere. I wasn't so much into that. Rather, I enjoy landscape. My favorite cities in Italy are Florence, Manarola (part of Cinque Terre), and the Amalfi coast area. I wish we had more time there and to go to Sicily and Sardinia. Venice - So I liked Venice for about an hour. Lots of bridges, boats and walking! Then I was pretty much done with it since the food was so terrible and other than St. Mark's Basilica, I was church-ed out. I had the worst gelato, pizza, coffee, and pasta ever here, haha all the things Italy are known for. Everything is also ridiculously overpriced. Venice is one of the few cities where there are a lot more tourists than locals. Boat rides were cool the first time, then they just got annoying. Maybe I would like it more if they had better food. However, the aerial view from the plane was amazing and the general architecture of the city is pretty neat. 9. Beautiful Venice. View from the Rialto bridge. 10. View of Venice and St. Mark's Basilica from St. Mark's Bell Tower. Florence - one of my favorite cities I visited! There are a lot of museums, statues, art, churches, history to see if you are into that kind of stuff, but what really did it for me was the delicious food, stunning architecture, and the air of romance, hah so corny. Had one of the best meals in Italy (top 3 in this trip overall, for sure) at Osteria del Cinghiale Bianco. The Florentine steak and the panna cotta were particularly exceptional. Fresh truffle dishes are so cheap in Italy! Only a few Euros more than any other dish for a very generous serving. I went crazy. A lousy 3g serving in the US will at least be a $30 supplement. The gelato at Vivoli was also fantastic. It was so good we went here 3 times in one day, haha. I can't decide if I like that better than Gelateria del Teatro in Rome. 11. L->R: Mozzarella with truffles and wild boar, Steak Florentine and Fettuccine with black truffles, panna cotta, and gelato from Vivoli. 12. View of Florence and surroundings from Giotto's Tower. Cinque Terre - Another favorite... especially Manarola! My original plan was to hike to all five villages via the Blue trail but unfortunately, two of the four segments were closed. Massive flooding last October nearly destroyed Vernazza. The Via dell'Amore trail is great for all you love birds. The trail from Monterosso to Vernazza was really pretty, with lots of pretty views of the beach and rows of grapevines and olive trees. Wish we came here when the weather was better so we could go swimming and catch boat ride. Lots of local foods to try here: olive oil, dry white wine, Sciacchetra, tagliatelle, and trofie. Delicious! 14. The picture everyone takes of Manarola. Rome - I was overwhelmed with all the things to see in Rome on the first day. However, once we made progress through our bucket list, I was quickly bored. The Colosseum is a must see for sure, but I did not enjoy the Vatican as much as others did. It reminded me of the World Expo.. large mass of people and ridiculously long lines. Food was a hit or miss, but when it was good, it was really good. Had some prime cappuccino/espresso/macchiatto from Tazza D'oro near the Pantheon. We came here multiple times a day, every day while we were in Rome, haha. We also had the most mouthwatering pizza ever (truffles with bufalo mozzarella) at Da Francesco, gelato (white chocolate basil!!) at Galateria del Teatro, and this zucchini sauce pasta dish at some restaurant I forgot. Also did a lot of retail damage in Rome. So many cute boutiques! 15. L->R: Cappuccino maxi, their famous iced coffee, latte maxi from Tazza D'oro. 16. Roma pass was so worth it to get out of the line for this! 17. 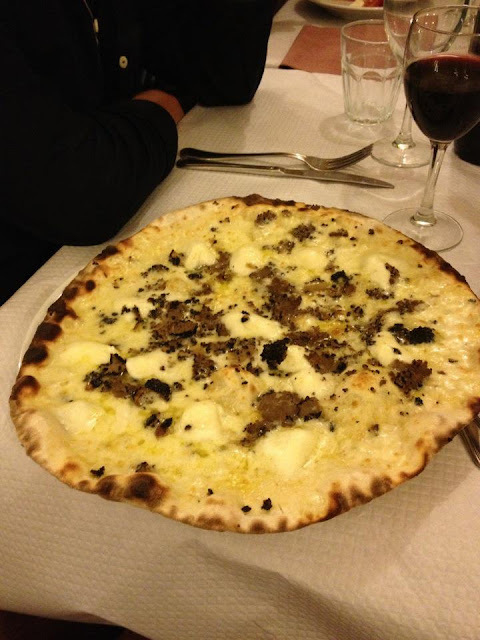 Best pizza ever at Da Francesco: bufalo mozzarella and truffles. Haha, a pizza with truffles at Tony's in SF will cost you $100+. 18. White Chocolate Basil round 2!! Amalfi Coast / Positano - We drove from Rome to Positano. We stopped at Pompeii to see the ruins and then drove along the Amalfi Coast. Such a scenic drive! I really liked it here too. They do wonders with lemons: limoncello, granitas, desserts, etc. The lemons are also extra large, like the size of a baby's head... and they are tons of it! I think I just like cities with lots of beaches. Reminds me of home. 19. Hello Amalfi coast! View of Sorrento. Plenty cliffs! 21. Yup, and had to do a handstand in Positano, too. Naples - We did not have much time here except in transit to/from Capri. We had the original margherita pizza at Da Michele and it was the best plain pizza I've had. Apparently they've been making pizza for five generations! 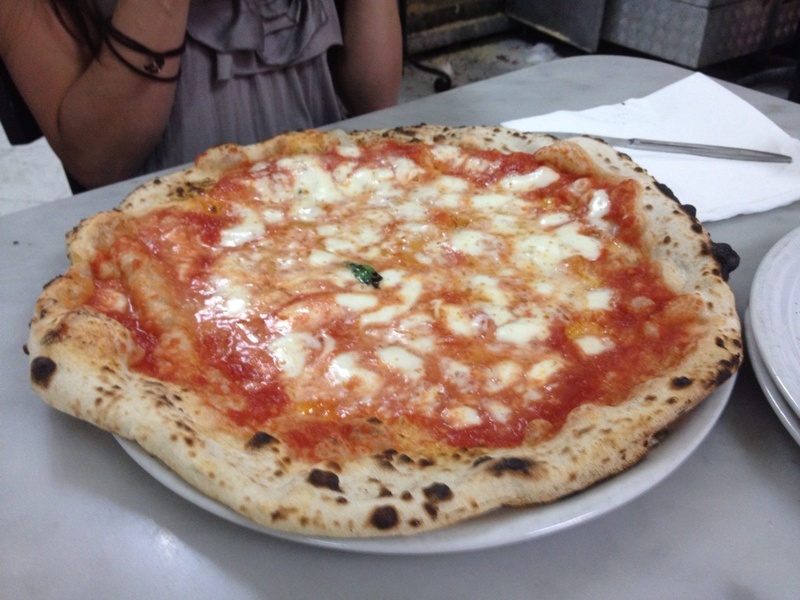 Stuff in Naples seem to be cheaper than other cities in Italy and a lot of people say food in Naples is the best. If only we had more time to verify that. I also stopped at CrossFit Napoli... almost missed our boat ride to Capri because of it! But totally worth it! 22. Only 4.5 Euros for a large pizza. They do something amazing with the dough. One of the only pizzas where I ate the crust. Capri - If we redid this trip, I would skip Capri. It' is super touristy, ridiculously expensive, crowded, only OK food (also expensive), and you are stuck on a small island. Though, the Blue Grotto was dazzling! The cave entrance could barely accommodate the small row boats; there is no headroom. Once inside, it was huge, and the water was this unique, lovely, brilliant blue. It's hard to describe and the pictures don't do it justice. Also, the bus/taxi ride was memorable. It was just as scary/thrilling as that in India! The road is super curvy, narrow, and is two-way. They drive really fast literally coming within less than an inch from hitting the car adjacent to it! 24. View of the giant Faraglioni rocks. 25. My favorite tourist attraction on Capri: the Blue Grotto. No filter. 26. Post Blue Grotto tour. I had a lot of fun on this trip. I got to see a lot of pretty sights, try new things, and I had some of the best tasting food ever. Now, I am so sick of pizza and pasta. I still love truffles and gelato though. My visits to CrossFit Cannes and CrossFit Napoli to come next!